Preface. 1. Calcium and Evolutionary Aspects of Aging (M.P. Mattson). 2. 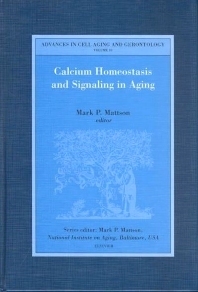 Calcium Homeostasis and Signaling in Aging (T. Fujita). 3. Cellular Calcium Dynamics (K. Furukawa et al.). 4. Impact of Aging on Calcium Channels and Pumps (M. Yamaguchi). 5. Calcium Homeostasis and Learning Deficits in Aging (J. Disterhoft, W.W. Wu). 6. Calcium and the Pathogenesis of Neurodegenerative Disorders (M. Mattson, C. Gilman). 7. Altered T-Lymphocyte Calcium Signaling and Age-Related Disease (G.F. Weber). 8. Calcium Dysregulation, Insulin Release and the Pathogenesis of Diabetes (P. Bergsten). 9. Calcium Homeostasis and Skeletal Muscle Alterations in Aging (O. Delbono). 10. Genetic and Dietary Factors in Age-Related Bone Loss (S. Ferrari). Contributor Addresses. This volume of Advances in Cell Aging and Gerontology reviews the mechanisms that regulate cellular calcium homeostasis in various tissues throughout the body and how these systems change during aging. Normal functions of calcium in regulating various physiological processes are considered and the evidence supporting roles for perturbed calcium regulation in the pathogenesis of several prominent age-related disorders are detailed. The cross-disciplinary approach used to organize this book should provide readers interested in a specific area of calcium regulation with a broader perspective and a framework for which to shape future studies in their laboratories.